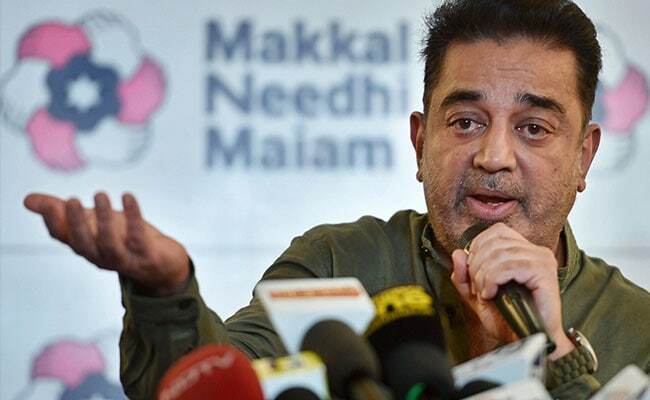 Kamal Haasan said Tamil Nadu had been denied its rights and "somebody" was blocking the state from receiving justice just when it was so close to. Chennai: Superstar Kamal Haasan, one of the most vocal leaders in Tamil Nadu on implementing the verdict on the Cauvery water sharing, has amped up the campaign against Tamil Nadu's E Palaniswami government and the centre for sitting tight on the Supreme Court's verdict. Travelling to the heartland of the once-fertile Cauvery delta region over 300 km from state capital Chennai, Mr Haasan, 63, told NDTV that the BJP-led national coalition's last-minute move to seek a clarification from the Supreme Court was motivated by electoral politics; the elections in Karnataka. "It is a political game. It is obvious," Mr Haasan told NDTV on his way to Tiruchirapalli, also known as Trichy where he will address a huge public meeting later on Wednesday evening. But then, he said, this was something that people of Tamil Nadu were aware of. "But as a new party's founder, I will have to reiterate it," he said. Kamal Haasan said Tamil Nadu had been denied its rights and "somebody" was blocking the state from receiving justice just when it was so close to. "It (Justice) is at our door step, and now it is being delayed. Just when we were all set to celebrate," he said. The superstar -- who has acted over five decades -- got himself a new day job in February this year when he launched his political party, Makkal Needhi Maiam, from Madurai, considered the state's political capital. Over the past few days, he has taken to reaching out to people who he believes are suffering due to the government's policies or inaction. This week, he had also travelled to the port city of Thoothukudi, also known as Tuticorin, where villagers have been protesting to demand closure of the copper smelting plant complaining that it had accentuated air and water pollution. Trichy is the second stop for the newly-minted politician. Many Tamil Nadu leaders had reconciled to the Supreme Court judgment, telling farmers that the state would still gain if the Cauvery Management Board, to be set up on the court's orders, ensures that Tamil Nadu gets this lower allocation too. The 765-km-long Cauvery river, originates in Kodagu district in southern Karnataka and flows into Tamil Nadu, Kerala and Puducherry. Called the Ganga of the south, it is considered a lifeline for Karnataka and Tamil Nadu. But the central government did not set up the board till the deadline expired, and later filed a clarification in the top court. This has exposed AIADMK leaders, who had showered praises on PM Narendra Modi at a function to mark Jayalalithaa's birth anniversary in February, to sharp attacks from the opposition including the DMK. Kamal Haasan's campaign on Wednesday only means more trouble. The day after, the opposition DMK has already called for a shut down across the state. Chief Minister E Palaniswami and his deputy O Panneerselvam appeared to brace themselves for the fresh round of attacks by joining party leaders at a token, day-long hunger strike in state capital Chennai. Mr Haasan said all political parties were to blame. The politician said consecutive governments had been playing with the lives of delta farmers on either side of border, Karnataka and Tamil Nadu. "And they have been playing ruthlessly without regard for livelihood. So much so, Tamil Nadu has almost come to the point of depleting all its groundwater sources," he told NDTV. Kamal Haasan had initially planned to make his train journey to Trichy a mega event along the way and was expected to meet fans at railway stations along the way. But the railways reportedly disapproved of the initiative, pointing that it would inconvenience other passengers. Trichy is full of posters and festoons welcoming Kamal.